Many of the recent images and videos I’ve shared here have featured amazing views from the Space Station. At 225 miles up, astronauts aboard the ISS enjoy an unprecedented and privileged view of our world, literally from the edge of space. In addition to having a vantage point from which to view the countries, continents and oceans below, they also get to observe amazing atmospheric phenomena from a unique viewpoint that few humans have experienced. From lightning storms flashing strobelike within the clouds to the undulating ribbons of the aurorae, the ISS crew sees it all – and shares it with us in the photos they take. Another phenomenon that’s not so visible from Earth’s surface but shows up regularly in astronaut images is something known as airglow. A photochemical reaction that occurs high in the atmosphere, airglow is the result of various atoms, molecules and ions that get excited (chemistry-excited, that is… not “whee!”-excited 🙂 ) by ultraviolet radiation from the Sun and then release that energy as visible light when they return to their “normal” state. It’s not entirely unlike glow-in-the-dark toys or paint! 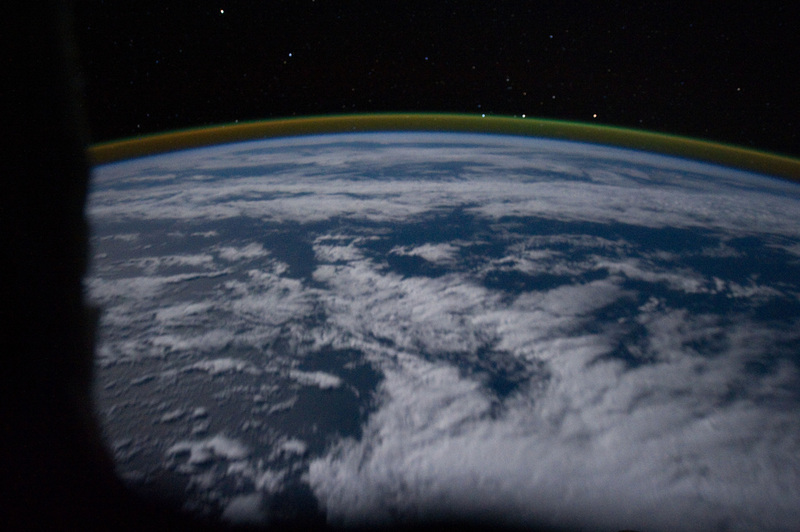 This light is most visible to the crew of the ISS when it is orbiting over the night side of the planet, and thus is seen in images like the one above. It appears like a thin band because viewing the atmosphere at a shallow angle – rather than directly down through it – increases the airglow layer’s relative visibility. Read more about this fascinating (and photogenic!) phenomenon in my article on Universe Today. Next Post Vision: Save The James Webb! It looks like a mega rainbow, are their skittles at the end of it? Nice explanation. Just discovered your blog. Wonderful! If you or your readers haven’t seen the outstanding large format book, “The Home Planet,” you’ll be delighted to behold it. It’s packed with incredible photographs taken by astronauts and cosmonauts, those lucky few who have experienced this lovely planet as it really is: a gorgeous, small, and priceless oasis. Their comments on the experience are the text. My copy is autographed by Rusty Schweikert and Yuri Romanenko. In the days before light pollution, Earthbound skywatchers were familiar with this phenomenon as evidenced by an apparent lightening of the sky all around the horizon. Few places get dark enough now for this to be seen. does anyone know if this is what causes the green flash that you can see at sunset some nights? The green flash is different.. it’s the result of light refraction through the atmosphere. Airglow is actually the emission of light from ions in the atmosphere.